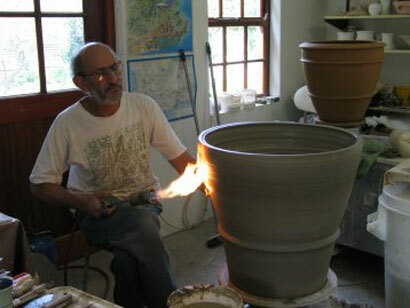 This page has a series of pictures of David throwing a commissioned planter in sections using a blowtorch to dry the various stages as the piece takes shape. About 80kg of clay was used to make this piece which stands about 800mm tall. Throwing Big Pots. Throwing Big Pots. The clay is beaten into a cone shape by holding the lump in the left hand and applying a downward beating motion with the palm of the right hand. Each time the clay mass is turned slightly in a clockwise direction. 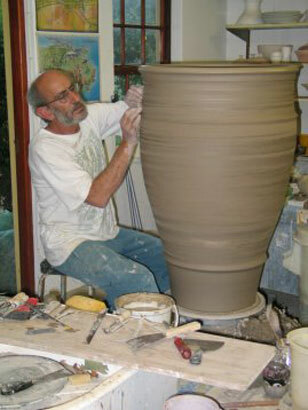 The desire to throw large pots is something that just about every potter has at one time or another. And often it is met with frustration, especially if you are relatively new to wheel throwing. I used to think that I just didn’t have the strength to do it, and resigned myself to throwing medium-sized pots. But there are all sorts of ways to throw large without breaking your back. Today, I am presenting some tips from large-pot-potter and upsizing your pots. It includes some great cross-section diagrams that clearly show what should be happening both inside and outside of the pot. Follow these tips and you’ll soon be in charge of the clay! 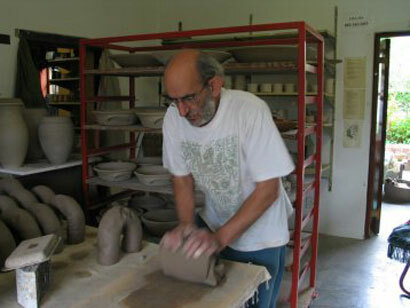 I have noticed during some of the teaching I have done that many potters who have been taught to throw using an electric wheel pay very little attention to the shape of the piece of clay they are about to use on the wheel. Sometimes it is almost a cube! 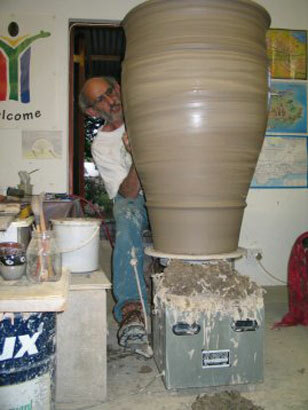 To help combat some of the problems of centering larger pieces of clay it makes sense to beat the clay into as uniform a cone shape as possible, before it goes onto the wheel. When I am starting to throw, much attention is given to the shape of the clay. 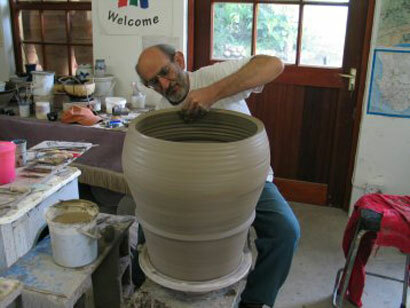 Of course when the pot is completed you will need to remove it from the wheel. I find that a good-quality ply board bat works well. The hardwood ply that almost all local builder’s merchants supply is fine, simply cut as many circular bats as you can from one sheet. I would recommend a thickness of 9–12mm (3/8 –1/2 in. ), cut into 30–36cm (12 – 14in.) discs. Alternatively, you can easily buy ready made wooden bats if you prefer. Bats can be simply attached to the wheel head by throwing some clay into a flattened disc and with a throwing tool making concentric grooves in it. The wooden bat can then be placed in the centre and tapped down, creating a firm seal. If your wheel head has pins, you can attach a bat with corresponding holes by simply slotting it over these pins, which it much easier. However, although this method is very useful for removing a partly-thrown pot on its bat, which can then easily be put back on to the wheel already centered to continue throwing, it has a drawback in that when centering large amounts of clay the plywood bat can tend to lift off the pins. For this reason the disc of clay method, although slower, can often be better. Want more tips for super sizing your pots? I am proposing that you try using your knuckle or the heel of your hand. Throwing, using fingertips might be okay if you are only making small pots like mugs. Fingertip throwing with larger pots is not recommended. It will be very difficult to control the clay and will result in you not being able to lift the clay, and therefore a very uneven lift, and probably a wobbly rim. By using the knuckle of your right hand and applying pressure from the inside with the finger of the left hand, much more clay can be lifted in a more controlled way. It is always very good practice not to use excessive amounts of water when throwing normally, as if too much water is used, the clay being worked on will become saturated and eventually collapse. As is the case with my momentum kick wheel, most wheels for making large wares will have no wheel tray. So it is good not to use much water, as if water spills onto the flywheel it will become rather messy and difficult to use. 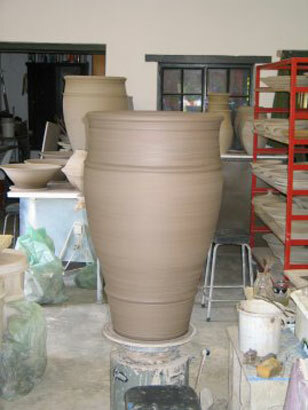 When throwing large pots most of the work can be done using very little or indeed no water at all. Instead, use a softer clay rather than a harder one, and use a clay-slip lubrication rather than water. As you will see further into this book, most of the work will be done in the centring process by beating and shaping the clay without using any water. 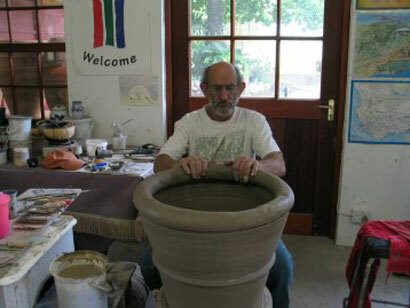 The large pot you are making will also be able to support more added clay more quickly, if you can use less water in the making process, as it will remain stronger and will not need so much time to dry and firm up again. It is worth wedging up all the clay you think you will need for one vessel or piece of work, as you don’t really want to stop half way through in order to prepare clay. Once you learn the quantities that you can throw comfortably, you will have a better idea of how much you need, but when starting out it is a learning process. Approximate quanitites used for each ball are given in further chapters, depending on the piece being made. 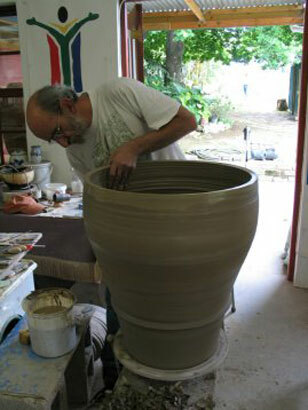 Thank you for spending time on our Throwing Big Pots pages.